View of “Michel Parmentier,” 2018. For Michel Parmentier’s first US museum exhibition, twenty-seven artworks represent the phases of his life’s work—from his imposing paintings of the 1960s and early 1980s to his delicate works on paper, in which his antigestural stance chafes against his scrawls of graphite and oil stick. Rounding out the show are archival materials and his writings on art, as well as a documentary film by Bernard Bloch depicting the artist at work, demonstrating the centrality of critique to his practice. While these are essential to contextualizing the works, it is the remarkable consistency of his principles and vision and the unintended romanticism of his devotion to them that emerge most vividly here. 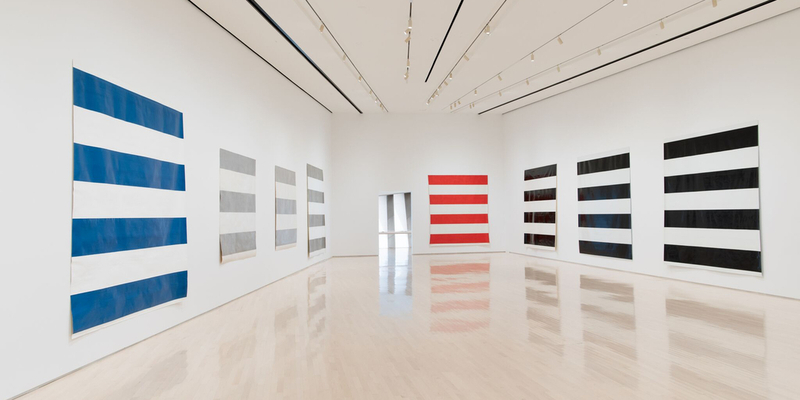 In a 1990 text coauthored with Daniel Buren, Parmentier denounced his contemporaries on the “French scene” as “totally devoid of a critical approach to painting.” By then, Parmentier had spent almost twenty-five years honing his own critical approach. He formed the artist group BMPT in 1966 with Buren, Olivier Mosset, and Niele Toroni. Attacking gesture and narrative in painting, the members wrote manifestos and staged happenings. Above all, Parmentier was always a strict adherent to self-imposed aesthetic principles. From 1966 to 1968, he produced large-scale, unframed paintings of horizontal stripes, thirty eight centimeters wide, in colors that changed annually, using pliage, in which the ground is folded before it is painted. Following a hiatus from art from 1968 to 1983, he picked up where he left off, this time with black stripes and, later, drawings on tracing paper. Despite his claims of detached criticality, Parmentier’s commitment to an ideal of aesthetic purity inspires a sense of melancholy for purity’s inevitable end.